For centuries it seemed an impossible dream that international institutions could ever tell nation-states how to treat their own citizens. But after a century in which 160 million lives have been wasted by war, genocide, and torture, the worldwide human rights movement is gaining popular and political strength. 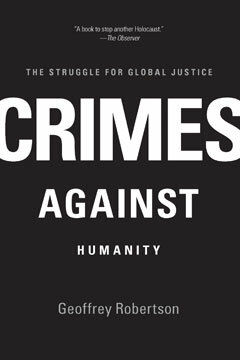 In a book that has been called “an epic work” by The Times (London), Geoffrey Robertson, one of the world’s leading human rights lawyers, weaves together disparate strands of history, philosophy, international law, and politics to show how an identification of the crime against humanity, first defined at Nuremberg, has become the key that unlocks the closed door of state sovereignty, enabling the international community to bring tyrants and torturers to heel. This newly revised and expanded edition features additional chapters on Iraq and Guantánamo, and incorporates insights from the author’s experience since 2002 as a UN appeals judge for the Special Court on war crimes in Sierra Leone. Robertson also brings us up to date on the trials against Slobodan Miloševic and Saddam Hussein and the International Criminal Court at Darfur.